Mike Halliday and John Wardle, New Zealand Tree Grower November 2005. 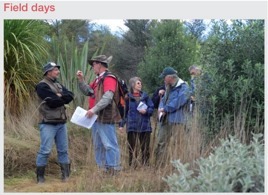 The Indigenous Forest Section of the NZFFA was formed in August 1995, partly in response to the passing of the Forest Amendment Act 1993 and the effect this had on owners of private native forest. There was the perceived need to protect the rights of private owners to retain the option to manage their native forests in a way that they considered appropriate. But there was a proviso that the Indigenous Forest Section would only support management options which were carried out in a sustainable fashion. The stated objective of the organisation was to promote indigenous forestry in the widest possible sense and to encourage management practices which would preserve the unique characteristics of native forests for future generations. Implicit in this objective is that the section would be involved with all aspects of indigenous forest management; such as management for conservation, biodiversity enhancement, aesthetics and production. In addition it would encourage the enrichment of degraded areas of forest and scrub, as well as the planting of native species for conservation, production, shelter and amenity. This broad holistic approach remains the prime objective of the Indigenous Forest Section. However, added emphasis is now being placed on management for biodiversity retention and enhancement. Many farmers have areas of native forest and scrub in gullies and elsewhere on their properties, and perhaps most of them are primarily interested in the intrinsic values that they offer. Many have QE II covenants, and this has prompted the section to develop strong linkage with the QE II National Trust. At the same time, management for production from existing forests and establishment of plantations using indigenous species still remains part of our aims. At present, the Indigenous Forest Section has about 190 members with at least 25 having joined in the last six months. Its activities include advising the NZFFA executive on relevant policy and political matters as well as keeping members informed on technical matters. It encourages each branch to host at least one field day emphasising some aspect of indigenous forestry annually. The section also requests an optional field day which has an indigenous forest flavour from the host branch of each annual conference. The main method of informing members is the quarterly magazine Indigena. Tane’s Tree Trust has been receiving a fair amount of publicity recently, in part related to workshops held throughout the country promoting the planting of indigenous trees. This has prompted a number of our members to question the difference between the two organisations. At its formation, the Indigenous Forest Section got the full support of the Executive and other prominent members of the NZFFA. But it was implicit that the section was a part of the NZFFA, and Indigenous Forest Section members therefore needed to belong to the NZFFA. It was later recognised that there were many people outside the NZFFA with an interest in planting native trees who could not participate in the Indigenous Forest Section because they did not wish to become full members of the NZFFA. There were also those who did not feel comfortable belonging to an organisation which encompassed production from existing forests, even where this was carried out in a sustainable fashion. As a consequence, in September 2001, Tane’s Tree Trust was formed. Instrumental in its formation were the then chairman and vicechairman of the Indigenous Forest Section. From its inception Tane’s Tree Trust decided it would not become involved in any form of existing forest management, be it for conservation or production. Instead it would concentrate on raising the profile of planted forests for a wide range of values including timber production. The trust considered that by being a single issue organisation it would be able to be more effective in its role. The Indigenous Forest Section on the other hand is involved with the management of existing indigenous forest for a wide range of values including conservation, timber production or the enrichment of the flora and fauna it supports. The area of linkage between the two organisations is in the promotion of planting indigenous tree species, and in this area the liaison between the two organisations is extremely good. The first ten years of the Indigenous Forest Section have seen some highs and lows, especially with the unfortunate bogging down of the National Standards for Forest Certification. But it is quite clear that many tree planters are turning to native species for riparian management, shelter, providing biodiversity corridors and enrichment, as well as the long term plantation prospects of some species. The Indigenous Forest Section is able to provide information on all these topics, as well as on the management of existing native forests, and it helps in providing political input at local, regional and national levels. 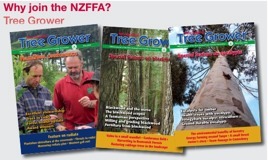 To join the Indigenous Forest Section, contact NZFFA. Membership costs $20 annually, and entitles you to a copy of each issue of Indigena. Alternatively copies can be obtained, if available, by paying $8 per issue – $9 if postage is involved – to John Wardle, PO Box 40, Oxford. Phone or fax 03 312 4171. Mike Halliday is Chairman of the Indigenous Forestry Section.